There is no doubt about Netflix ruling the Internet. The company’s total revenue jumped from 1.36 billion dollars to 11.69 billion dollars in between 2008 to 2017. These numbers itself show the great success of the company. 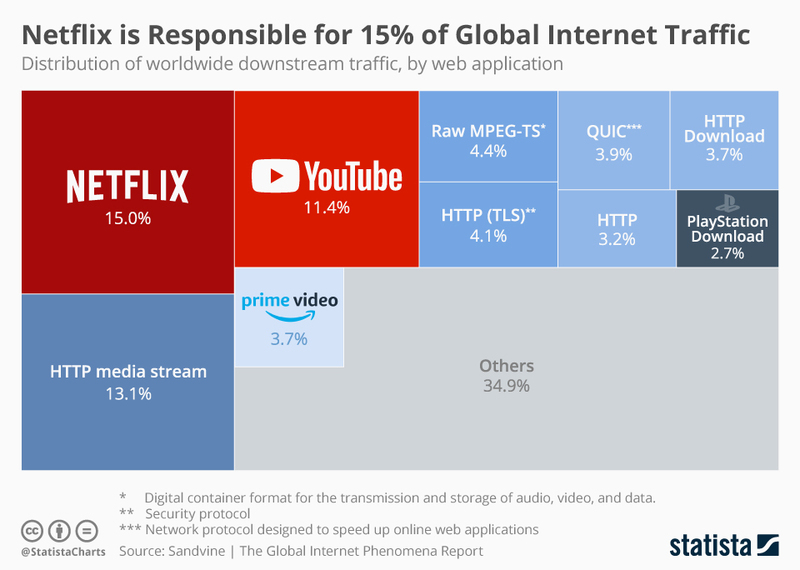 Improvement in internet speed and bandwidth cost favored the Netflix to become one of the top online Entertainment website by contributing 15% of the total global internet traffic followed by YouTube which shares 11% of it. After that amazon prime comes to the third place with 3.9% of global internet traffic share, which is no way near to the above two. To achieve this all was not easy, as Netflix has to face many challenges to attain this status. The company which was founded in 1997, with the business of selling and renting DVD via mail. Till YouTube launched streaming video that got immediate popularity among the people. Sensing this change Netflix started modifying its business model to meet the global needs, from rental DVD to online streaming. This change in strategy favored the company’s business by continuous increase in sale every year. To maintain this performance Netflix is expecting to pump 1 billion dollar on a new studio in Mexico.